Want to add a little rhythm to your backyard? Our large woodpecker house collection offers a number of attractive designs that will add character, along with a flock of woodpeckers, to your backyard. 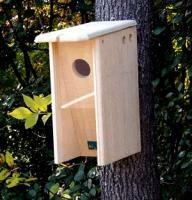 A woodpecker house can be constructed with a variety of wood types, from cypress to mahogany. 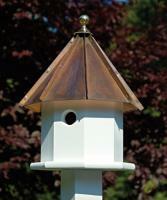 The most distinctive feature of a woodpecker house tends to be the roof, which is often hand-shingled and is available in shades from copper to olive. 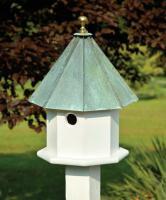 Think a woodpecker house might be what you’re looking for? Our friendly customer service team can help you find the right product for your needs. In addition, every woodpecker house we sell--like all of our products--is backed by a 100% money-back guarantee, so you can be confident you’ll be satisfied in your purchase. I like the house its well made and the woodpecker likes it to. The birdhouse is beautiful! I'm saving it, however, for the Spring time, to use on my balcony with my Spring/Summer hanging baskets. 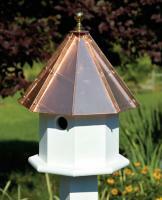 Well made, beautiful birdhouse, very good price. How to Stop Woodpecker Damage - If you hear constant drumming on your house from woodpeckers, they may be causing damage. Here's what you can do to discourage them from pecking at your home.